MayDay music and dance, trah la! 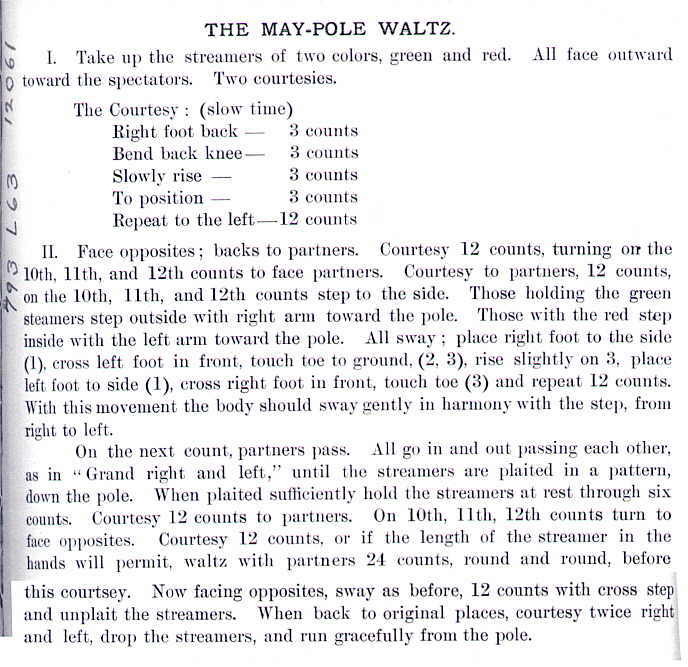 Every year I get more requests for information on how to celebrate May Day so here are some basic suggestions about May-poles, dances, and music. Since Mayday has been celebrated for thousands of years all around the planet, I can assure celebrants that there is no ONE right way. (click here for history of Mayday) Following is a sample list, ranging from simple to difficult, of celebration suggestions. 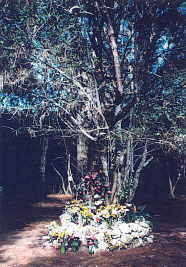 An ancient and easy May-pole is to designate a living tree such as this ‘witch tree’ in the Canary Islands. When I was in Northern Germany, I saw a variation on this theme on the Rhine River. A tree in a yard outside a tavern bloomed with yellow ribbons and bows. May-poles decorated with garlands is a standard theme. While this is more difficult because construction is required, the decorations are done before the celebration. 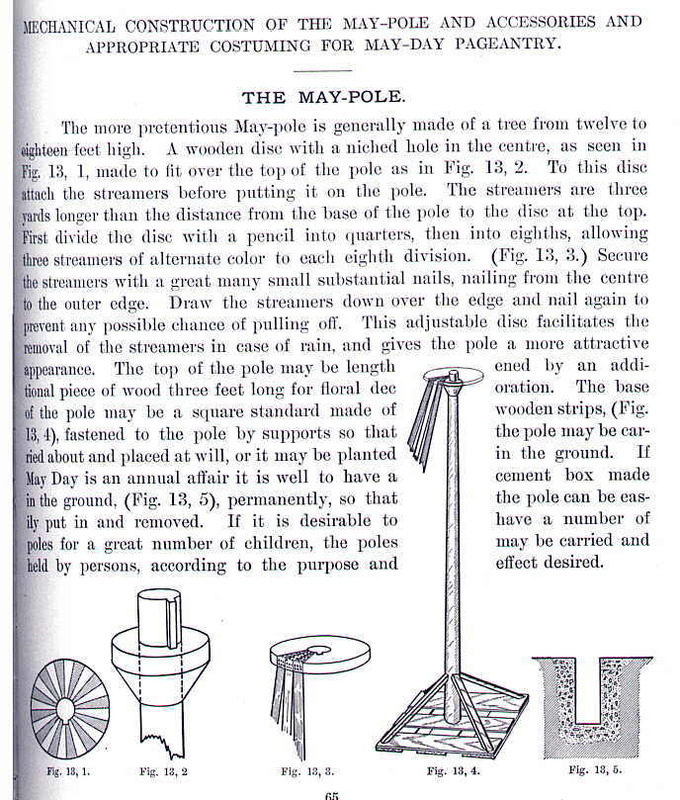 Bedecked with garlands of flowers, this type of May-pole would be ideal for young children to dance around. Most difficult is the May-pole woven with ribbons, not because it is harder to construct or decorate than other types of May-poles, but because ribbon weaving dances are too complicated for children to accomplish. Two colors of ribbons are used and dancers alternate steps and directions. The following instructions and related dances were devised for college women who were willing and able to practice before their performance. There is an important thing about beribboned May-poles -- the dancers expect an audience. In ancient Europe, the Mayday procession was a march around the village, the marchers holding baskets, wreaths, May-poles or effigies. The stations of the march would include village wells, barns where milk cows were housed, and around the village boundaries. This can easily be adapted to a march around the playground or park. A little bit more difficult is “Thread the Needle,” a simple procession of couples which somewhat resembles “The Stroll” ( an American teenage dance popular during the 1950’s) Children line up, boys on one side, girls on the other. The couple on the end steps forward, greet each other, then proceed to march through the lines. Another variation is to have a flower and ribbon trimmed arch which the other children march under.
. Courtesy to partners, 4 counts.
. Courtesy to opposites, 4 counts.
. Form a circle and side-step to right, once around, and back again to places.
. Grand right and left. 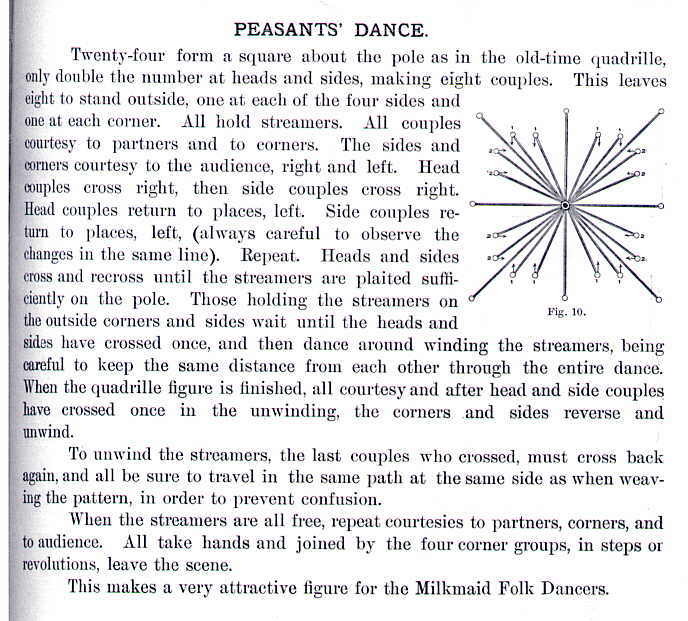 Note the similarity between these steps and American barn dancing, or square dancing. 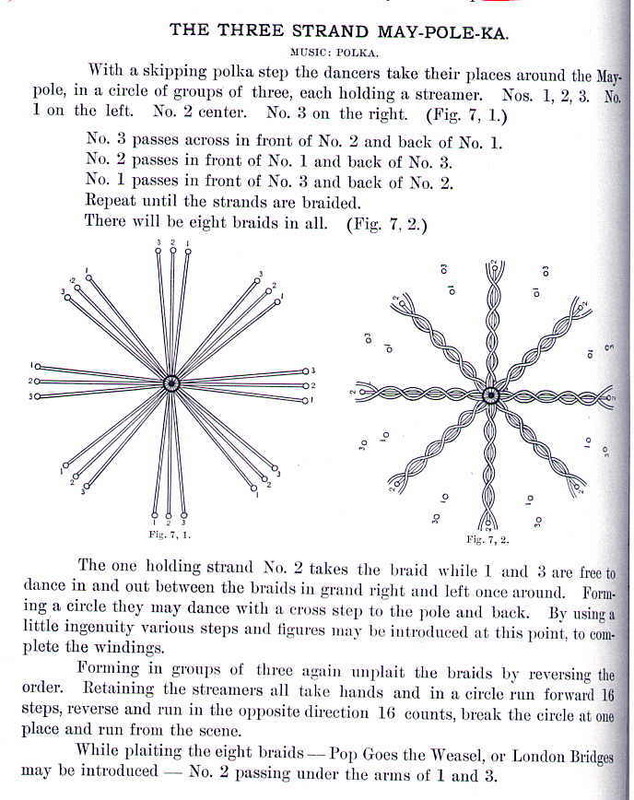 This dance is done around a May-pole decorated with garlands, rather than plaited ribbons. Most complicated is weaving ribbons around the May-pole. These instruction come from a book published in 1907. You will have to figure it out for yourselves. Good luck. It was performed by college students who practiced long, hard, and with enthusiasm. What about music? The real answer is: anything goes. There has never been traditional tunes connected to Mayday, although the traditional English instruments are a pipe and a drum (played by the same person.) If you still need guidance on the matter, I will suggest the Virginia Reel or a formal waltz or ‘Comin’ Through the Rye’ I am posting some sheet music from my source books.